The songs of The Beach Boys are some of the happiest and most upbeat musical compositions in American pop music history, wholesomely performed by three brothers, their cousin, and a childhood friend. Who would have thought that one of those brothers, the one who wrote or co-wrote an overwhelming majority of those smiley, head-bobbing hit songs, suffered from mental health problems that caused him to have several nervous breakdowns? That man, Brian Wilson, is the subject of Love & Mercy. Love & Mercy is actually two interconnected stories, told simultaneously but with a kind of cause-and-effect theme. Part of the narrative takes place in the sixties, where Brian Wilson (Paul Dano from Prisoners and Little Miss Sunshine) steps back from the physical and psychological rigors of touring with The Beach Boys to concentrate on writing and producing the Pet Sounds album while the rest of the group tours Japan without him. That story flip-flops intermittently with that of the eighties Brian (The Raven‘s John Cusack), a recluse who meets a charming car saleslady named Melinda Ledbetter (Elizabeth Banks from The Hunger Games) whom he would like to date, but he is unfortunately under the twenty-four hour supervision of his domineering psychiatrist Dr. Eugene Landy (Paul Giamatti from Sideways), who doesn’t really let Brian do anything on his own. Both of Wilson’s timelines unfold to tell the story of a tortured and enigmatic genius. The screenplay for Love & Mercy was written by Oren Moverman (The Quiet Ones) and Michael Alan Lerner (Deadlines), with Brian Wilson himself given writing credit for having lived it, and it seems to follow the events of Wilson’s experiences pretty closely, at least as far as any outsider would be able to tell. 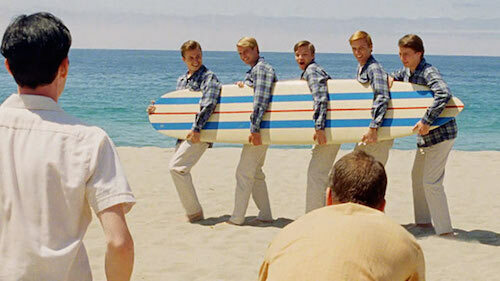 Director Bill Pohlad (more well-known as the producer of hits like 12 Years a Slave and Brokeback Mountain) has tried to keep the film as authentic as possible, going so far as to painstakingly recreate actual photo shoots and television performances by The Beach Boys. Whenever possible, Pohlad even tried to shoot in the actual locations that original events depicted in the film took place, be it a childhood home, a stretch of beach, or a recording studio. Pohlad’s eye for nostalgia and attention to detail coupled with his unique vision for storytelling makes Love & Mercy an amazing biopic, but it’s also much more than that. It’s an amazing movie. There is a ton of conflict in Love & Mercy, and that’s what gives the movie its energy and spark. There are also ingenious parallels between the two overlapping narratives that Pohlad emphasizes in the name of connecting the two stories. For example, the younger Brian’s overbearing father (played by Compliance‘s Bill Camp) is replaced by the domineering Eugene Landy. Furthermore, the voice of reason shifts from cousin/bandmate Mike Love (Jake Abel from Good Kill) in the sixties to Melinda Ledbetter in the eighties. For everything that happens in the nostalgic portions of the film, Pohlad seems to find a parallel in the modern era. Love & Mercy is an engrossing portrait of an enigmatic artist, and the interweaving timelines show not only the then-and-now situations of Brian Wilson’s life, but the repeating patterns of behavior as well. Love & Mercy will get categorized as a rock & roll movie by many, and it is packed front-to-back with classic music from The Beach Boys. However, the music is more of a backdrop than a plot point; Love & Mercy will entertain and intrigue all viewers, not just those who are fans of Brian Wilson and his music. 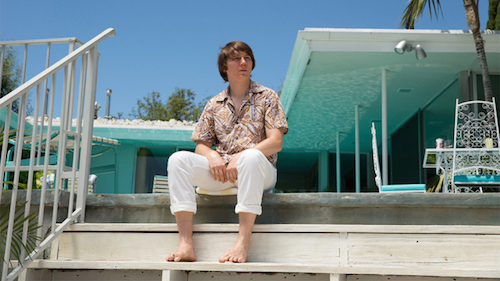 Paul Dano’s performance as the younger Brian Wilson in Love & Mercy is amazing. He’s got the hair, the clothes – he even has the same round face and baby fat that Wilson had in his twenties. But, it’s more than just his physical appearance that makes this portrayal so special. Dano seems to channel Wilson in an uncanny, method acting kind of way which gives his scenes an improvisational feel, forcing the viewer to wonder if he’s really even acting, or if he’s just riffing for the camera. Paul Giamatti is also incredible as the psychiatrist Dr. Eugene Landy; he is so good at being a manipulative, deceitful jerk that the entire audience wants to collectively punch him in the face. John Cusack is not quite as successful at portraying the older Wilson, but in his defense, it’s a tough part, and it’s hard to look at Cusack without thinking of him as Lloyd Dobler in Say Anything…, so that works against him a bit. The other lead in the film is Elizabeth Banks as the older Brian’s love interest, Melinda, and she’s serviceable, but nothing special. She looks great, but her performance is fairly non-descript, she’s just there as a sounding board for Cusack and Giamatti. Overall, however, the performances in Love & Mercy are above average, and Dano’s alone is worth the price of admission. Because Love & Mercy is set in two different time periods, it has two very distinct visual styles. Cinematographer Robert D. Yeoman (Wes Anderson’s go-to director of photography, with credits that include The Grand Budapest Hotel and Moonrise Kingdom) goes to great pains to keep whichever time period is onscreen straight in the viewer’s mind. The eighties story, with John Cusack as Brian Wilson, is shot in a fairly traditional style, more polished but also a little bland. The sixties-era segments, with Paul Dano, are brilliantly put together. These scenes are shot with 16mm handheld cameras in long, shaky takes so that the footage has a cinema verité feel. Maybe it’s because they’re more authentic looking and original, but the older segments are more effective than the new; the viewer really feels like they’re a fly on the wall of the recording sessions, or as if they’re watching a home movie of the band. Yeoman uses clever photography to make sure that each section of Love & Mercy has its own look and feel, and that, in turn, helps the storytelling process.